NEW YORK — PhotoPlus Expo, one of the largest photography conferences and expos in North America, has announced its second annual photo contest, themed “Perspectives” a celebration of the human experience, a theme that is ideal for travel photographers. The deadline to enter is September 14, 2017. PhotoPlus Expo is calling for your best photos that capture the human experience in the following categories: Portraits, Street Photography, Food Photography, Architecture and Landscapes. Grand Prize winners in the Professional and Amateur categories will each receive a trip to Germany to attend the renowned photokina in Cologne, Germany in 2018, or a trip to PhotoPlus Expo in New York City in 2017. All contest winners will be featured in the PhotoPlus Expo Show Guide and the “Perspectives” international traveling exhibit, which will make its debut at PhotoPlus Expo in New York on Thursday, October 26th at the Jacob Javits Convention Center, then travel to photokina (Germany), FHOX (Brazil) and CPPS/Studio of Masters (China). The contest is also sponsored by FHOX, an international photography organization and magazine that promotes the work of photographers from all over the world, the China Portrait Photography Society (CPPS), and Studio of Masters, which are responsible for the growth of the portrait photography industry throughout China. In addition to winners having their photos publicly displayed and published internationally, several photographic manufacturers will provide hundreds of dollars in prizes to many of the winners. Prize sponsors for this year’s contest include Fujifilm, OmegaBrandess, Red River Paper, Ikan Corporation, Iris Works, Drobo, PRL Lighting, LaCie and Mini Wing USA. The call for submission is open for the “Perspectives” photo contest. There will be a fee of $20 per professional entry and $15 per amateur entry for each photo entered into the contest, but contestants may enter as often as they would like. PHOTO+ members will receive a 30% discount for each photo entered. DEADLINE FOR ENTRIES: SEPTEMBER 14, 2017. To enter the contest and see the full contest rules, go to contest.photoplusexpo.com. All winning images and honorable mentions will be placed on exhibit during the PhotoPlus Conference + Expo at the Jacob Javits Center from October 26-28, 2017. The exhibit will be seen by more than 20,000 photographers and consumers expected to visit the photo expo this year. “Perspectives,” the exhibit, will travel internationally and be displayed at a variety of photography fairs around the world, including photokina in 2018. Designed for professionals in the photographic and imaging industries as well as enthusiasts, PhotoPlus Expo―www.photoplusexpo.com―showcases the latest advances in photography, digital imaging and filmmaking. Held annually at the Javits Convention Center in New York City, attendees have the opportunity to explore an inspiring array of photography and imaging products and services―all from the industry’s leading manufacturers. The show also offers seminars, intimate Photo Walks and Master Classes taught by world-renowned experts that focus on cutting-edge innovations and techniques. PDN PhotoPlus International Conference + Expo is owned by Emerald Expositions, the largest operator of business-to-business trade shows in the United States, with most of our shows dating back several decades. We currently operate more than 50 trade shows, including 31 of the top 250 trade shows in the country as ranked by TSNN, as well as numerous other events. Our events connect over 500,000 global attendees and exhibitors and occupy more than 6.5 million NSF of exhibition space. We have been recognized with many awards and accolades that reflect our industry leadership as well as the importance of our shows to the exhibitors and attendees we serve. 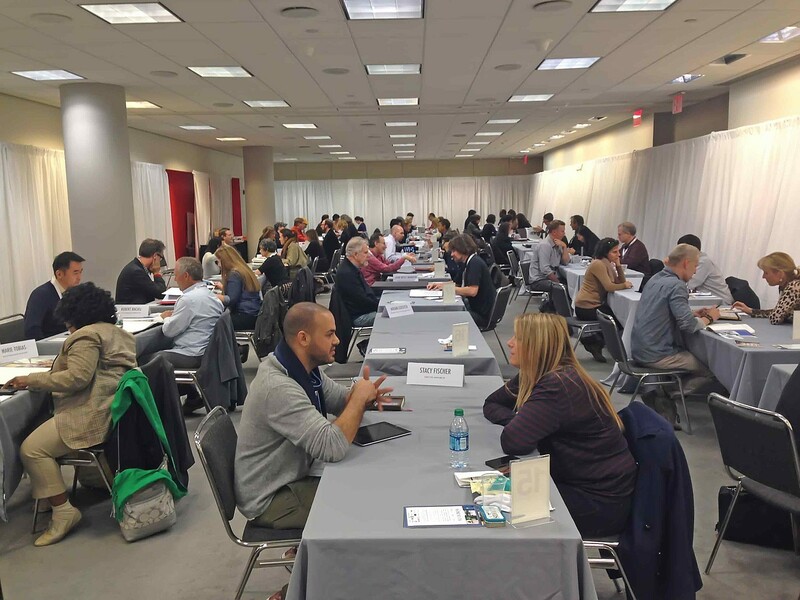 The Official Portfolio Review Program at PhotoPlus Explo at the Javits Convention Center in New York, Oct. 29-Nov. 1, is the largest and most cost-effective way for photographers to gain access to many of the world’s leading industry influencers. One of the most effective ways to advance your career as a photographer is to have world class pros review your existing portfolio and offer sound advice for building a stronger portfolio to share with prospective customers and clients. The Official Portfolio Review Program at PhotoPlus Expo at the Javits Convention Center in New York, Oct. 29-Nov. 1, is the largest and most cost-effective way for photographers to gain access to many of the world’s leading industry influencers. Outside of PhotoPlus Expo, access to these industry influencers is virtually impossible and cost prohibitive. This year, the portfolio review program has been expanded to include video to meet the growing demands of the industry – photographers, videographers and filmmakers will be able to present and receive feedback on short films to demo reels. At PhotoPlus Expo, presented by the Palm Springs Photo Festival, photographers (and videographers) will be able to sit down with dozens of top picture editors, art buyers, gallery owners, and art directors to have their portfolios reviewed and have one-on-one discussions about how to take their careers to the next level. On Wednesday, October 29, the Official Portfolio Review Program will host a special Beginning Pro Day, exclusively for photographers launching their careers and those seeking portfolio consultations. Reviewers will help these photographers determine proper image selection, sequencing, and offer overall career advice and counseling. This is an opportunity for attendees embarking on careers in photography and video to receive one-on-one advice from some of the most successful and influential professionals in the business. Portfolio reviews for Emerging Pros and seasoned Professionals will be available from Thursday, October 30 through Saturday, November 1. The Official Portfolio Review Program is essentially a job fair for photographers featuring more than 175 influential professionals, and unlike other review programs, participants will be able to select and prioritize the reviewers who will review and critique their work. Last year, more than 1,600 portfolios were reviewed at PhotoPlus Expo and that figure is expected to increase this year due to the addition of the Beginning Pro program scheduled on Wednesday, October 29. Every approved registrant for the Official Portfolio Review Program will also receive free admission to PhotoPlus Expo, which includes the opportunity to try and compare the latest gear from hundreds of exhibitors and the ability to register to attend any of the 80-plus seminars and panel discussions scheduled throughout the show. Photographers can see the complete list of reviewers and can register online to participate in five portfolio reviews. The cost for Beginning Pros is $250 and the cost for Emerging Pro and Professional Photographers is $275. Attendees who book 10 or more reviews will receive a 10 percent discount. For more information or for frequent updates, visit the PPE website, become a fan on Facebook, or follow PPE on Twitter. 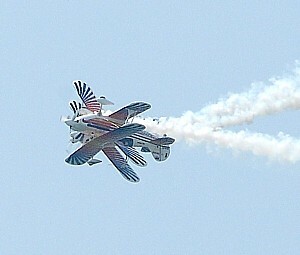 Use a digital SLR camera, set for shutter speed priority of at least 1/500th to catch the action at the Jones Beach Memorial Day Airshow, like these two Iron Eagles biplanes that seem to be entangled. Hone your skills in outdoor and adventure photography at the first annual PDN Outdoor Photo Expo show, to be held at the Hilton Salt Lake City Center on August 4-5, 2011 (© 2011 Karen Rubin/news-photos-features.com). The Nielsen Photo Group (NPG) announced that registration for its first annual PDN Outdoor Photo Expo (OPE) show in Salt Lake City is now open. Outdoor Photo Expo is the first trade show dedicated to the outdoor photography market including adventure, landscape, nature, outdoor sports, travel and wildlife and will coincide with the Outdoor Retailer Expo August 4-7, the world’s largest outdoor and retail show. OPE will be held at the Hilton Salt Lake City Center on August 4-5, 2011. Salt Lake City and its surrounding mountain range is the perfect setting for two days of educational training, special events, evening gatherings and workshops specifically created for outdoor, adventure and travel photographers. Attendees will see some of the latest imaging technologies and learn new tips and techniques from some of the most renowned outdoor and adventure photographers in the world, including Frans Lanting, Art Wolfe, George Lepp, Moose Peterson, Corey Rich, among others. Internationally acclaimed outdoor and nature photographers Frans Lanting and Art Wolfe will provide the keynote presentation to conclude the first annual PDN Outdoor Photo Expo on Friday evening, August 5th. Their presentation titled, ” Frans Lanting and Art Wolfe: Photo Power for Planet Earth,” will showcase their collective works and provide interesting insight about the power of photography to shape ideas about our natural world. For additional information about the expo and educational seminar schedule click here. To register to attend the Outdoor Photo Expo click here. PDN is hosting a series of six HDSLR Video Workshops in select U.S. cities to help photographers learn how to get the most from their camera’s HD video capabilities. Sponsored by Sony, a HDSLR Video Workshop will be held in Salt Lake City on August 3-4 to coincide with the Outdoor Photo Expo. For more information about how to register for the HDSLR Video Workshop click here. PDN’S OUTDOOR PHOTO EXPO (OPE) will consist of two days of exposition and educational seminars. Currently there is no equivalent live event that is dedicated to the outdoor photography market: adventure, landscape, nature, outdoor sports, travel and wildlife. OPE is being held in conjunction with Outdoor Retailer which attracts thousands of buyers and senior level decision makers looking for outdoor specific products, services, brands, fresh ideas and outdoor innovation. OPE will focus on bringing together the latest and greatest technologies in the photography and imaging industries with thousands of end users from professional photographers and high-end prosumers to educators, studio managers, photo editors and more looking to take their craft to the next level. Photo District News (PDN), the award-winning monthly magazine has been covering the professional photographic industry for over two decades. Every month, PDN delivers unbiased news and analysis, interviews, portfolios of the latest photographic work, photographic techniques, new technologies, and more. The PDN network of web sites, including PDN online, Photoserve, Photosource, PDN edu and Emerging Photographer, is an unparalleled source of information and inspiration for professional photographers, photo buyers, visual creatives, photo students and their instructors. PDN also hosts the annual PhotoPlus International Conference and Expo in New York City drawing nearly 24 thousand attendees specializing in all sectors of photography and image making. In 2011, for the first time ever, the popular Wedding and Portrait Photographers International Assn. (WPPI) will host a conference and expo in New York City, which will be united with PhotoPlus Expo to combine and deliver the most comprehensive array of exhibitors, seminars and events serving the photographic industry at one time within the Javits Convention Center. Dates are October 26-29, 2011. For more information on PhotoPlus Expo and WPPI NYC@PhotoPlus click here.